Nah, we're just messing with ya! Jack hasn't been heard from in over a century, so it's pretty safe to say he's long gone. But as grotesque as his acts were, he did have a certain fiendish flair that could only be found in Victorian Era London, don't you think? 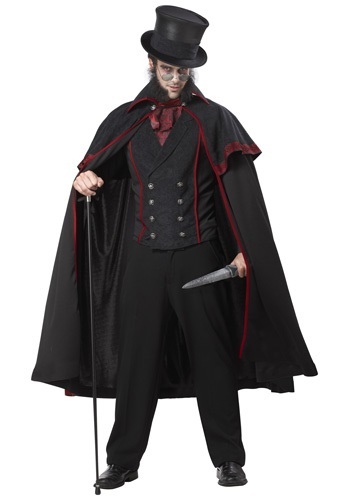 You can add some of that menacing style to your own Halloween outings in this spooky Jack the Ripper Costume, but we must warn you, this outfit is not for the timid. You may find yourself feeling unusually wicked while dressed in this dark ensemble, and prone to playing tricks on your friends. You might start sneaking around in the shadows, and leaving cryptically creepy notes for people to find, which could make everyone think that old Jack's back on the prowl! We wouldn't worry too much though, since we haven't heard of anyone picking up any of Jack's deadlier “hobbies” while wearing this costume. This black faux suede outfit will have you looking like a classic Victorian gentleman with a sinister secret, while the red trim featured on the vest and cloak matches the included jabot, and hints at your devilish side. Your diabolical style will be as notorious as the slasher that made it famous!